Composed by Gensangbuch der H.W.K. Hofkapelle, 1784; Ernewerten Gesangbuch, Part II, Straslund, 1665. Arranged by Christine Sullivan Robbins. Christian, Sacred, General Worship, Easter, Recital. Score. 3 pages. Published by Christine Sullivan Robbins (S0.18635). Pairing two hymns of praise - Ellacombe and Lobe den Herren - this jubilant piano arrangement sounds more complex than it is to play. 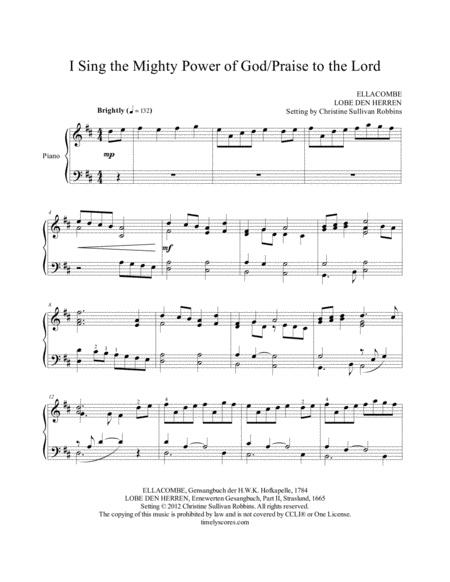 Upbeat, yet with a classical feel, it makes an excellent prelude or postlude, especially for Palm Sunday or Easter worship services, as well as a spirited selection for a recital. A great arrangement for church, and easily prepared. Not much practice needed!